Is your child in Year 5 or 6 in 2019? Check out our Atwell College Zone Extension Program! At Atwell College, the aim of the Zone Extension Program is to provide an enriching and challenging program to academically able year five and six students from our partner primary schools (Atwell Primary, Aubin Grove Primary, Hammond Park Primary, Harmony Primary, Honeywood Primary, Jandakot Primary and Success Primary). Expert facilitation takes the students through a myriad of rich educational experiences in the College's 'state of the art' buildings, like the multimillion dollar performing arts centre and the brand new laboratories. The college offers a range of after school courses each term, catering for varying needs and interests of our community. The courses aim to combine the students existing passion with the knowledge and skills necessary to successfully obtain a position in one of our elite programs at the college whether it be academic, sporting or the arts. Application for 2019 Term 2 courses is now open and all submissions must be completed online by Monday 1st April 2019. 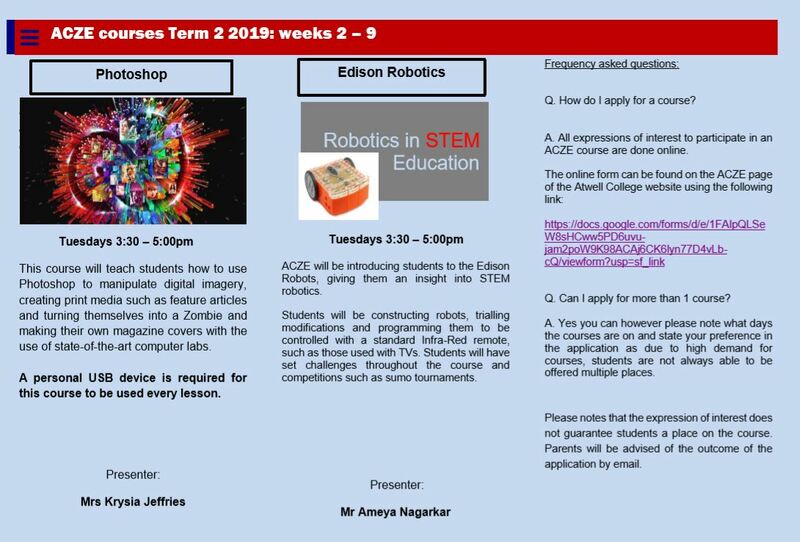 See here for the 2019 Term 2 courses.